I think whatever method you use, the key is to have your hand off the lid by the time it slams shut. The dent comes from your hand still being there and banging down on the lid when it comes to a sudden stop. I tried this method yesterday, this is the best so far! Went down easy every try. Use the latch hook on the trunk lid itself! grab with finger, swing down with force, let go, it slams shut. No fingerprints, no dents forever! I should make a video and have it stickied. The engineers at the plant tour said to close it by pressing down on the hump above the front edge bracket. I've been doing that for over a year with not issues. He said not to close it via the buttress chrome piece because over time you will cause that edge to start bending down. For those of you that close it that way, look at the alignment of both sides before you push down the buttress into the chrome and you will see that one side is lower than the other. 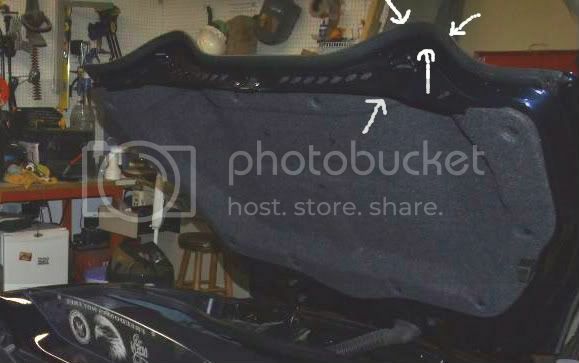 Hey deepbluegxp, can you explain better what when you say "the hump above the front edge bracket"? I've been doing the chrome buttress pin method and would like to learn the way you described, thanks. To take a different bend on this thread (pun intended), when I got my car back from the dealership after they replaced the top I was attempting to close the trunk and it just kept bouncing up. After several attempts (not very smart ) I finally noticed that a rubber bumper on the underside of trunk lid (there is one on each side of the lid) that apparently helps position the top in the trunk, had fallen off into the drain channels and was keeping the lid from shutting all of the way. Of course my efforts to close it forcefully resulted in a slightly warped trunk lid (larger gap on the passenger side rear lights than on the driver's side). I glued the rubber piece back on with gorilla glue but just recent had to reglue it. It is easy to bump off if working in the trunk. With the trunk open, you can see the front brace I have an arrow pointing to. Above that brace 1 inch back on the humps is where you should be pushing to close the trunk. Hey guys, I did the same thing on my 'hump' last year! Went to a paintless dent guy who worked miracles, it totally disappeared! Since then I close mine from the very center where the latch is and making sure not to still be pushing when it makes contact with the latch. The method with opening the small trap door to allow air out is an excellent idea! Aspenrose....soon to be known as Ninefingerrose. My car was delivered with a dent on the hump from closing the lid by the make ready guys. They had their paintless dent removal guy attack it, and you absolutely can not find it anymore. Amazing, really. My Solstice trunk closed easily, but my Skys is a BEAR. You have to **SLAM** it. That is, until a forum member told me to try the "lift the silver flap" method mentioned earlier in this thread. I'll be dang. That solved it. It now shuts SOOOOO much easier.